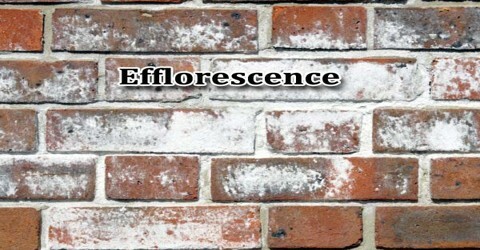 Efflorescence is a whitish, powdery deposit on the surface of rocks or soil in dry regions. It is formed as mineral-rich water rises to the surface through capillary action and then evaporates. 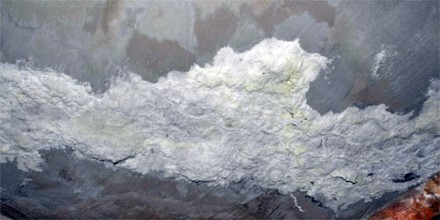 Efflorescence usually consists of gypsum, salt, or calcite. It is formed when water reacts with the natural salts contained within the construction material and mortar. The water dissolves the salts which are then carried out and deposited onto the surface by the natural evaporation that occurs when air comes into contact with the surface of the wall or floor. The essential process involves the dissolving of an internally held salt in water, or occasionally in another solvent. The water, with the salt now held in solution, migrates to the surface, and then evaporates, leaving a coating of the salt. It can occur in natural and built environments. On porous construction materials it may present a cosmetic outer problem only (primary efflorescence causing staining), but can sometimes indicate internal structural weakness. For example, the vapour pressures of washing soda (Na2CO3·10H2O) and Glauber’s salt (Na2SO4·10H2O) normally exceed that of the water vapour in the atmosphere, these salts effloresce (i.e., lose all or part of their water of hydration), and their surfaces assume a powdery appearance. Hydrated cupric sulfate, or blue vitriol (CuSO4·5H2O), the aqueous vapour pressure of which is lower, undergoes efflorescence only if the air in contact with it is relatively dry. Efflorescence or salting can be found on fresh plaster too. Salting on fresh plaster can look white and fluffy. As mentioned above the cause of efflorescence is water reacting with the salts in the plaster or other building materials and can occur after a water leak, or where there has been a case of severe condensation. Preventing Efflorescence of Brick and plaster may not be possible, if it is caused by materials getting wet in the building process then people may need to simply allow the surface to dry fully and then treat the surface. 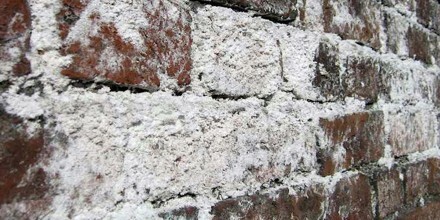 Under normal circumstances white, fluffy efflorescent salt occurs in relatively new buildings because the brickwork was not protected from the weather during construction. 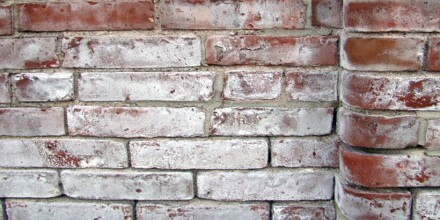 The brickwork becomes saturated while the wall is built, and when finished this water finds its way out of the porous bricks in the wall by evaporation; it leaves the salts behind on the surface of the brick when it evaporates. If salts are not completely removed from the surface of the wall, they can stay in the pores of the brickwork and dissolve again when it is wet, causing further staining. There are some brick stain treatments which generally contain acid and involve getting the surface wet again, and so this also gets the salts wet again. This dissolves the salts and carries them into, not out of, porous surfaces. The first type of efflorescence is called primary efflorescence. This type of efflorescence occurs when concrete or masonry work is in the process of curing and the water within the concrete rises to the surface. The rising water often carries minerals. As it comes to the surface and evaporates, it leaves behind traces of minerals. For controlling primary efflorescence, formulations containing liquid fatty acid mixtures (e.g., oleic acid and linoleic acid) have been commonly used. The oily liquid admixture is introduced into the batch mix at an early stage by coating onto the sand particles prior to the introduction of any mix water, so that the oily admixture is distributed uniformly throughout the concrete batch mix. Secondary efflorescence is named such as it does not occur as a result of the forming of the cement stone or its accompanying hydration products. Rather, it is usually due to the external influence of concrete poisons, such as chlorides. It occurs because of some outside influence that does not mix well with the concrete. For example, secondary efflorescence can occur where concrete meets steel on a bridge. For controlling secondary efflorescence, admixtures containing aqueous-based calcium stearate dispersion (CSD) are often added at a later stage of the batching process with the mix water. In a typical batching process, sand is first charged into the mixer, and then the oil-based primary anti-efflorescence admixture is added with constant mixing to allow the oil to coat the sand.